Give your students a chance to do some math while also letting their artistic side show! My students love showcasing their other talents while still meeting their math obligations. Your students will love it, too! 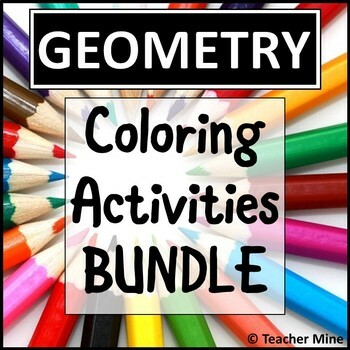 This product contains a collection of coloring activities from various topics covered throughout a high school geometry course. Students will find the indicated value for each question. Then, they will find the correct answer that is paired with a color at the bottom of the page. Finally, each section will be colored by matching the color with the problem number. These products are not included in my full geometry curriculum. If you are interested in finding out more about what is included, click any of the links provided above. If you are interested in purchasing multiple site licenses for a grade/department, school, or district, contact me at teacherminestore@gmail.com. Please protect the proprietary nature of this product. It should not be made available to others without purchasing the license. Become a follower and get notified when new products are made available. They are 30-50% off for the first 48 hours! If you have any questions or requests, feel free to email me at teacherminestore@gmail.com.